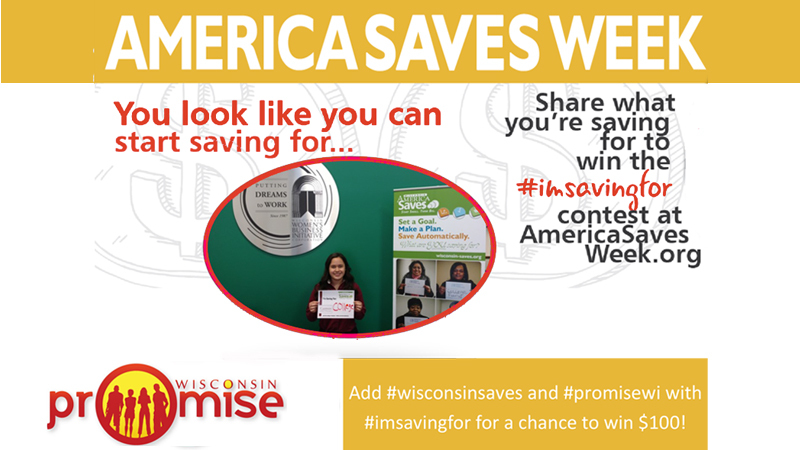 Wisconsin Promise is pleased to participate in America Saves Week, February 22 – 27, 2016. Are you in the situation where saving seems impossible? Do you find it challenging to live paycheck to paycheck or you are a student with part-time job? By taking a look at what is really essential in your day to day living, you may be surprised by how much you can save by just making small changes. “Every penny counts and the earlier you start the habit of saving, the easier it will be throughout life. Paying yourself first, no matter how small your paycheck, is the best way to develop good spending habits!“ comments Kevin Smith, Financial Capability Director of the Wisconsin Women’s Business Initiative Corporation and America Saves Week Coordinator for Wisconsin. Using your credit card and not paying them off every month leads to expensive interest payments – increasing the cost of everything you buy. With savings to fall back on, you may use your credit cards less. Planning for a rainy day…emergencies happen and can be expensive. Having savings in place will help you respond and recover from unexpected expenses. As your savings grow, you will have the ability to plan to bigger purchases like a car or a home. Having savings means more freedom to make choices like taking a vacation, going back to school or switching careers, helping family members, etc.